Inventors are inspiring to learn about whether you use them as part of a larger science study or whether you focus your studies on the inventor him or herself. Our family loves the Who Was ® series of books and I have posted before about some of the books we have enjoyed. In this post, I organized a list of all of their books to date of inventors. There are 14 in total! At the bottom, there are FREE printable bookmarks you can download to take notes on while reading any of these books. This includes First Ladies, too! Click on the pictures of the books to purchase or learn more! Studying da Vinci could accompany so many studies, including physics, art, and early flying machines. A great book to accompany any type of astronomy or weather study. A perfect book to introduce the study of physics. While this book is often included in a study of the birth of the United States, it is also perfect as part of a study of electricity, sound or light. The story of Louis Braille would fit a unit study about disabilities or communication and could be read along with our Helen Keller unit study. With over 1000 patents to Thomas Edison’s name, this book is great for any study of inventors or to accompany a study of electricity. It would be great to read this with Who Was Nikola Tesla? and compare the two men, their inventions and their lives and to learn about the difference between AC and DC power. Learn about what influenced Alexander Graham Bell to invent the first practical telephone. If you are studying electricity, this book makes a great companion. It would be great to read this with Who Was Thomas Edison? and compare the two men, their inventions and their lives and to learn about the difference between AC and DC power. This book would be great when studying botany, gardening or as part of Black History Month. Learn about the assembly line and the mass production of cars. Perfect for car lovers in the family! A great addition to a chemistry study or as part of Women’s History Month. Learn about the beginning of aviation! Also a fun addition to studying the state of North Carolina. This a great book to use as part of a study of physics, but I would definitely save this one for middle school due the complexity of the theory of relativity and Einstein’s other theories and discoveries. A biography all kids can relate to! Perfect for kids who like coding or just love their tablets and iPhones! Use the bookmarks to take notes while you read any of these books. Sometimes, I use them for reading comprehension and have my children narrate to me what I should write. Other times, I have my older son fill them out to give him practice writing and taking notes. Audible has the Who Was…books! Start a FREE trial, listen to a couple and see if you like them! 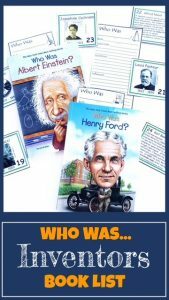 Subscribe to receive the Who Was Inventors in History Bookmarks and our latest posts and freebies straight to your inbox. 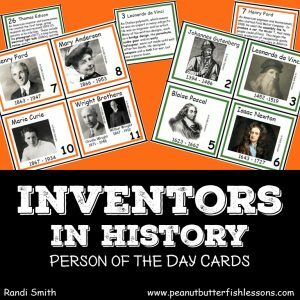 This is a set of 60 cards to teach about one inventor in history each day. From Archimedes to Charles Goodyear to Nikola Tesla to Marie Curie to Ruth Handler to 55 others in between. From electricity to the theory of relativity to the Super Soaker to the iPad. Each card contains the inventor’s name, picture, and years of life on the front. On the back is a detailed summary of what he or she invented and a few facts about their lives.